Entrance into garden room: lovely room with glazed doors overlooking the garden. 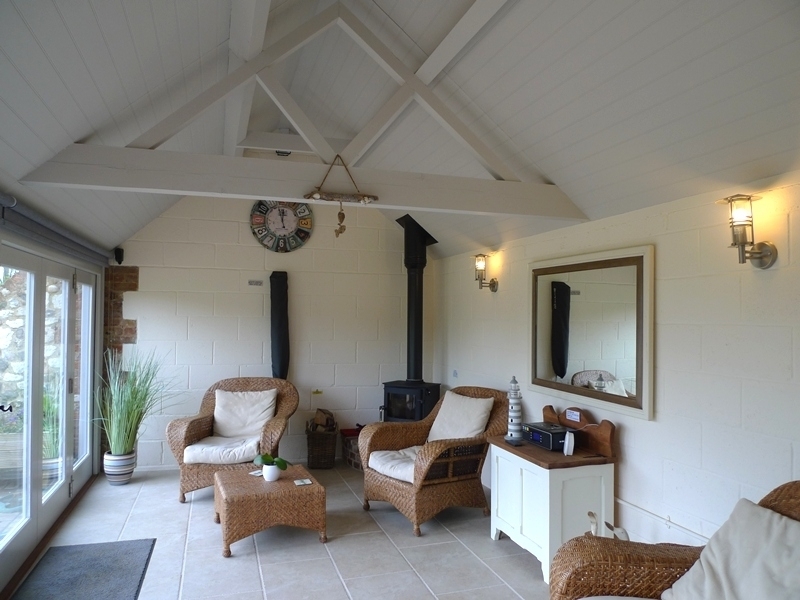 There is a wood-burning stove and underfloor heating to ensure that this room is warm and comfortable throughout the year, with wicker sofa and armchairs - perfect for relaxing and enjoying the view. Hallway - With the Wifi modem and also a Vodafone signal booster to improve mobile phone reception. Sitting Room: Lovely room with original beamed ceiling and a wood-burning stove. There's a leather sofa, armchair and beanbag, with a wall-mounted flat screen TV, Blu-ray DVD player and i-pod docking station. Wet Room: with a walk-in drencher shower, hand basin, WC, heated towel rail and a heated floor. Bedroom: Beautifully presented room with original beamed pitched ceiling and distant sea views. There is a double bed, bedside tables and lamps, chair, dressing table, hanging space and fitted high level TV with remote control. Access is via a quiet lane into a shingle driveway with parking for 2 cars. Hope Cottage has an attractive enclosed garden with floodlights, which is mainly lawned and backs onto the marshes. In the garden is a restored outside loo! There's an outside table and chairs as well as garden benches to sit and enjoy the peaceful location. 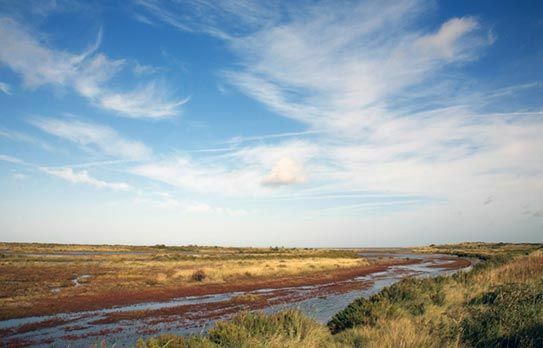 There is a public footpath near to the cottage with direct access onto the Peddars Way and the Norfolk coastal path. Please note that if you do wish to bring a dog (subject to max 2 dogs) to Hope Cottage, the owners have requested a £50.00 (per dog, per week) dog supplement, they have also stated that dogs should not be left unattended in the cottage and stay in the garden room and kitchen.